Both hit half-centuries – the Australian recording the fastest one of the competition from only 18 balls – as the hosts piled on a record score of 239 for three. 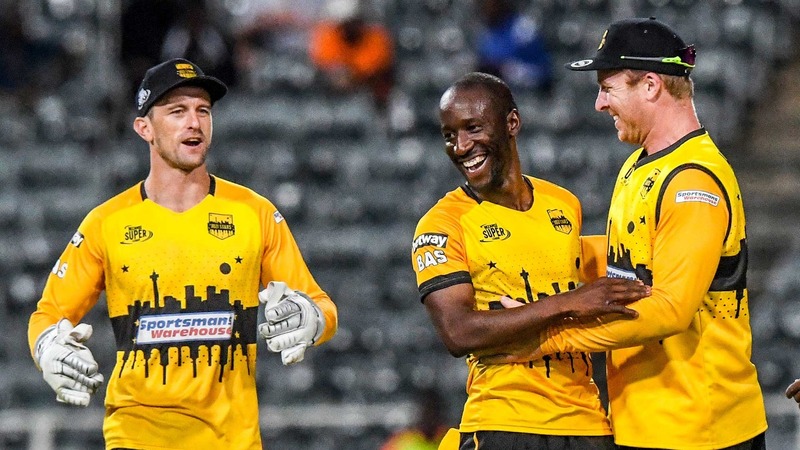 Nono Pongolo then produced the best bowling figures of the MSL T20 when he bagged six for 20, also his best career figures, as the Spartans were flattened for 138 in 17.2 overs. The result means the Stars will now host the Qualifier in Johannesburg on Friday against one of the Paarl Rocks, Nelson Mandela Bay Giants or the Spartans who could all finish on 21 points. The former two meet at Eurolux Boland Park on Wednesday with the Spartans taking on the Durban Heat in the late match on the same day. In the event of the three all finishing on 21 points, then Spartans will qualify as they won both their matches against the Rocks and both these sides have a greater number of wins than the Giants. The latter can qualify with a straight victory over the Rocks while the Rocks will get through if they win with a bonus point or score a straight win provided the Spartans lose. The Spartans will need to win with a bonus point to reach 21 log points. League-phase champions Cape Town Blitz await the victors of the play-off for the final at PPC Newlands on Sunday. On current form, Jozi look like they will take some stopping after they bulldozed their way past the meek Spartans at the Bullring. Ryan Rickelton (45), Reeza Hendricks (20) and Kagiso Rabada (21), used as a pinch-hitter, laid the platform for their side by getting them to 121 for three in the 13th over. It was then the Van der Dussen and Christian show, with the pair launching into the Tshwane bowlers. The former fell four shy of a century after blazing 96 off 44 balls (6 fours, 6 sixes), with the latter dealing only in sixes as he massacred six on his way to 52 off 19 balls. It allowed Jozi to post the highest total of the competition to date and left their cross-Jukskei rivals needing something special to secure the improbable. And unlikely it was as Pongolo produced the figures of his life to knock the stuffing out of the Spartans. Only Gihahn Cloete managed to cross 50 – he hit exactly that number off 40 balls (7 fours) – while there was little else in terms of support. Captain AB de Villiers fell to Kagiso Rabada via a superb catch by Simon Harmer, deflating any hope his side may have had. Pongolo kept chipping away at the other end to secure the Stars the biggest win of the competition.